Israeli forces continued with systematic crimes, in the occupied Palestinian territory (oPt), for the week of 14 – 20 February, 2019. In the Gaza Strip, the Israeli forces continued to use lethal force against the participants in the peaceful protests organized along the Gaza Strip borders, which witnessed the peaceful protests for the 47th week along the eastern and northern border area of the Gaza Strip. They also continued to use force as well during the incursions into the West Bank. 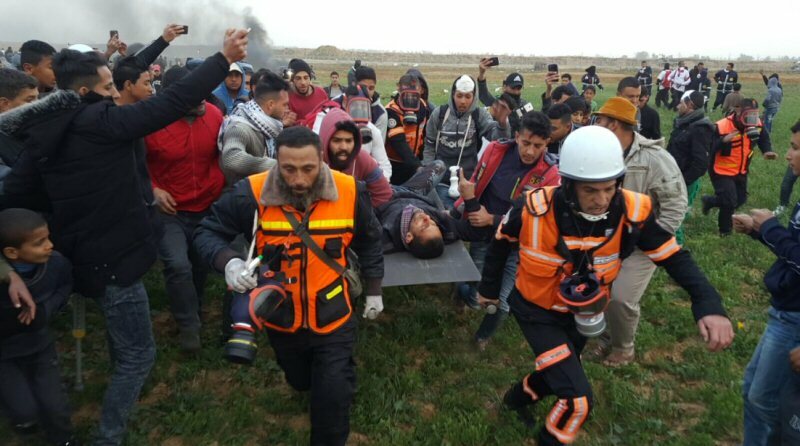 In the Gaza Strip, Israeli forces wounded 119 civilians, including 31 children, 6 women, 2 paramedics, and a journalist, while participating in the Return March. In the West Bank, 4 civilians, including a journalist, were wounded by the Israeli forces in different incidents. As part of targeting the Palestinian fishermen in the sea, the Israeli forces continued to escalate their attacks against the Palestinian fishermen, indicating the on-going Israeli policy to target their livelihoods. During the reporting period, PCHR documented 12 incidents were off the Gaza Strip Shores. The latest of these incidents was on Wednesday, 20 February 2019, Israeli gunboats stationed in the sea, west of Khan Yunis, south of the Gaza Strip, heavily opened fire at Palestinian fishing boats sailing within 11 nautical miles. The Israeli gunboats chased and surrounded 2 fishing boats; one of them belong to Tareq ‘Abed al-Razeq Baker, from Gaza City. The first fishing boat was manned by Hitham (27) and ‘Awad (22) Tareq ‘Abed al-Razeq Baker. Both of them were arrested in addition to confiscating his fishing boat. The second fishing boat belong to Khadir Marwan al-Sa’idi (30) and was manned by Khadir and Mohamed Sa’ied al-Sa’idi (27). Both of them are from al-Shati camp. The 2 fishermen were arrested and the fishing boat was confiscated. As part of targeting the border areas, Israeli forces stationed along the border fence with Israel, opened fire at agricultural lands, east of al-Bureij camp, and no casualties were reported. On the same day, Israeli forces stationed along the border fence with Israel, opened fire at agricultural lands, east of Gaza Valley village (Johr al-Dik), al-Buraij and al-Maghazi in the central Gaza Strip. No casualties were reported. On 17 February 2019, Israeli forces stationed along the border fence with Israel, opened fire at agricultural lands, east of Dir al-Balah, and no casualties were reported. On the same day, Israeli forces stationed along the border fence with Israel, fired 2 artillery shells at 2 checkpoints belonging to al-Qassam Brigades, and no casualties were reported. On 19 February 2019, Israeli forces stationed along the border fence with Israel, east of al-Shawka village, east of Rafah, opened fire at agricultural lands, and no casualties were reported. In the West Bank, Israeli forces wounded 4 civilians, including a journalist, in different incidents. During the reporting period, Israeli forces conducted at least 82 military incursions into Palestinian communities in the West Bank. During those incursions, Israeli forces arrested at least 54 Palestinians, including 6 children. Moreover, the Israeli forces conducted at least 3 military incursions into Jerusalem, where they arrested 33 civilians, including 2 children and a woman. As part of the Israeli house demolitions and notices, on 14 February 2019, Israeli forces surrounded a house belonging to Mohammad Moussa Razaina and demolished it under the pretext of non-licensing. The 80-square-meter house sheltered a family of 5 members, including 3 children. It should be mentioned that the Israeli forces had demolished Mhoammad’s house in 2016 under the pretext that it is close to the annexation wall. On 20 February 2019, Israeli Jerusalem Municipality bulldozers demolished 2 apartments and a horse stall in al-Ashqaria neighborhood in Beit Hanina village, north of occupied East Jerusalem. The first apartment built on an area of 72 sqaure meters and shelters Taysseeer Mohammad al-Mohtasseb and his family, which is comprised of 6 member, including 2 children, while the other apartment built on an area of 48 square meters and shelters Shadi al-Mohtasseb, Taysseer’s son, and his family, which is comprised of 4 members, including 2 children. Moreover, an 18-square-meter horse stall was demolished. As part of Israeli settlers’ attacks and demolition, Israeli forces accompanied with a bulldozer moved into ‘Ein al-Hejra, east of Dura, southwest of Hebron. The bulldozer damaged sheds that farmers of Abu Moqadam family made to sell vegetables produced in their land. The Israeli authorities alleged that the sheds were illegally established near bypass road (60). On 17 February 2019, Israeli forces accompanied with 2 bulldozers moved into Marakah area, in the eastern area of Beit Dajan, east of Nablus. The bulldozers started to demolish the 100-meter water line between al-Nassria village in the Central Jordan Valley and Beit Furik and Beit Dajan water well. On 19 February 2019, , Israeli forces accompanied with 3 Israeli Civil Administration vehicles and 2 bulldozers moved into Khirbet al-Ras al-Ahmar in the Northern Jordan Valley, east of Tubas. The bulldozers demolished 2 residential tents, 4 barracks for breeding livestock, a mobile bathroom, a water tank, and a sheep barn belonging to Jehad Mohammad Fahed Bani ‘Odah and Fatma Suliman Mafthy Bani ‘Odah. On the same day, Israeli forces confiscated 450m2 of street tiles out of 2760m2 located in Hayat al-Reef Park in al-Mas’oudiyia area, northwest of Nablus. It should be mentioned that the park is established on an area of 5 dunums, 3.5 of which are in (B) area and 1.5 in (C) area. On 14 February 2019, a group of settlers, from “Yitzhar” settlement, backed by Israeli forces moved into the east of ‘Urif village, south of Nablus. They raided ‘Urif High School for Males and lowered the Palestinian flag and tore it down. On 17 February 2019, a group of Israeli settlers, from the evacuated “Homesh” settlement in the east of Silat al-Dhahr village, south of Jenin, attacked a vegetable stall at the southern entrance of the village. The settlers stepped out of their vehicles and smashed the windshield of a car belonging to Abdul Kareem Jameel Ahmad Rabai’a (34), from Meithalun village, southeast of Jenin, which he uses to sell vegetables. Abuld Kareem immediately escaped leaving the stall on the street. Following that, the settlers stole some of the stall’s items. At approximately 19:00 on Thursday, 14 February 2019, Israeli forces stationed along the border fence with Israel, adjacent to the Return Camp, east of al-Shawkah village, east of Rafah, fired live bullets and tear gas canisters at dozens of Palestinian young men participating in the so-called “Night Disturbance”. As a result, 6 civilians, including a child, were wounded. 3 of them were hit with live bullets and shrapnel and 3 were directly hit with tear gas canisters. Gaza City: The Israeli shooting at Palestinian demonstrates resulted in the injury of 27 civilians, including 6 children, a women, and a journalist. Sixteen of them were hit with live bullets, 9 were hit with rubber bullets and 2 were directly hit with tear gas canisters. The wounded journalist Mohammed ‘Emad Mohammed al-Za’noun (33) was hit with a tear gas canister to the left hand. Northern Gaza Strip: The Israeli shooting at Palestinian demonstrates resulted in the injury of 6 civilians, including 4 children and a female paramedic. The wounded civilians were directly hit with tear gas canisters. It should be noted that the female paramedic was identified as Jamila Sobhi Youssof al-Feery (19). Jamila was hit with a tear gas canister to the abdomen. Central Gaza Strip: The Israeli shooting at the demonstrators resulted in the injury of 8 civilians, including 3 children and a woman. Six of them were hit with live bullets and 2 were directly hit with tear gas canisters. The injury of one of them was reported serious. Khan Younis: The Israeli shooting at the demonstrators resulted in the injury of 6 civilians. Three of them were hit with live bullets, 2 were directly hit with tear gas canisters and 1 was hit with a rubber bullet. Rafah: The Israeli shooting at the demonstrators resulted in the injury of 17 civilians, including 4 children and a paramedic. Nine of them were hit with live bullets and 8 were directly hit with tear gas canisters. The injury of 3 of them was classified as serious. The wounded paramedic was identified as Hussain Samir Mustafa Abu Snan (19). Hussian, who was hit with a tear gas canister to the lower limbs, works as a volunteer paramedic with Youth Emergency Team. At approximately 19:00 on Saturday, 16 February 2019, Israeli forces stationed along the border fence with Israel, east of Khuza’a villag, east of Khan Younis, south of the Gaza Strip, fired live bullets and tear gas canisters at dozens of Palestinian young men while protesting in the area within the so-called “Night Disturbance”. The Palestinian young men set fire to tires, lighted laser lights and fired fireworks at the border fence. As a result, 30 of them suffered tear gas inhalation and seizures and were taken to the Gaza European and the Algerian Hospitals, where they received treatment before leaving to their houses. At approximately 18:30 on Sunday, 17 February 2019, Israeli forces stationed along the border fence with Israel, east of al-Na’ayma Street, east of Beit Hanoun, north of the Gaza Strip, opened fire and fired tear gas canisters at a group of civilian, who approached the border fence. These civilians fired homemade sound bombs, set fire and used loudspeakers as part of the so-called “Night Disturbance”. As a result, a 23-year-old civilian sustained superficial wound to the left arm and back. He was taken to the Governmental Beit Hanoun Hospital, where doctors classified his wound as moderate. Around the same time, in similar circumstances, Israeli forces stationed along the border fence with Israel, east of the Return Camp, east of Abu Safia Hill, north of Jabalia, north of the Gaza Strip, wounded a 21-year-old male, from al-Shaikh Redwan neighborhood in Gaza City. The male was hit with a live bullet to the chest and then taken to the Indonesian Hospital in Gaza City. On the same day, a 17-year-old child, from al-Buraij Refugee Camp, was hit with a live bullet to the lower limbs near the Return Camp, east of al-Buraij Refugee Camp in the Central Gaza Strip. At approximately 19:00 on Monday, 18 February 2019, Israeli forces stationed along the border fence with Israel, fired live and rubber bullets at civilians in Malaka area, east of al-Zaytoun neighborhood, east of Gaza City. As a result 7 civilians, including 2 children, were wounded. At approximately 14:45, on 19 February 2019, Israeli gunboats stationed offshore, and Israeli forces stationed along the border fence between the Gaza Strip and Israel, opened fire and fired sound bombs at dozens of Palestinian civilians who were at the Return camp along the border coastal, adjacent to adjacent to “Zikim”military base, northwest of Beit Lahia in the northern Gaza Strip. It should be noted that this is the 24th time for Palestinian boats to sail for Breaking the Siege. As a result, 33 civilians, including 9 children and 3 women, were wounded. Sixteen of them were hit with live bullets and shrapnel and 17 were directly hit with tear gas canisters. The injury of one of them was classified as serious while the rest injuries were classified between moderate and minor. On Monday, 18 February 2019, Israeli forces attacked Jerusalemite civilians in al-Aqsa Mosque while protesting against close al-Rahma Gate, one of the Al-Aqsa Mosque gates. At approximately 10:00, Israeli forces closed al-Rahma Gate with locks and chains. When a Palestinian worshiper damaged the locks, the Israeli forces arrested 7 civilians, including a woman, and then took them to an investigation center in occupied East Jerusalem. The Israeli forces released the arrested civilians after detaining them for few hours and questioning them. The arrested civilians were released on one condition that they will deport from al-Aqsa Mosque for one week. The arrested civilians were identified as ‘Ammar Kastiro (31), Nour Shalab (24), Mohamed al-Zaghir (22), Husam Seder (35), Nizam Abu Rumuz (38), Raied Da’nah (34), and Nazimah Bkirat (40). At approximately 01:00 on Tuesday, 19 February 2019, Israeli forces moved into al-Thawri neighborhood, south of occupied East Jerusalem’s Old City. They raided and searched a house belonging to Mohamed al-Daqaq (28) and then arrested him. At approximately 01:30, Israeli forces moved into al-Thawri neighborhood, south of occupied East Jerusalem’s Old City. They raided and searched a house belonging to Mohamed al-Shalabi (35) and then arrested him. At approximately 02:00, Israeli forces moved into al-‘Issawiyia village, northeast of occupied East Jerusalem. They raided and searched 2 houses belonging to Majd Dari (23) and Ahmed Derbas (24) and then arrested them. At approximately 20:00 on Tuesday, 19 February 2019, after Palestinian worshipers performed al-Isha prayer, they organized a peaceful demonstration near al-Rahm Gate. The Israeli forces immediately attacked them and beat the worshipers. They also arrested 19 of them. PCHR keeps the names of the arrested worshipers. On Tuesday morning, 14 February 2019, Israeli forces accompanied with a bulldozer and crews of the Israeli Municipality moved into Beer ‘Ona neighborhood in al-Walaja village, southwest of occupied East Jerusalem. They surrounded a house belonging to Mohammad Moussa Razaina and demolished it under the pretext of non-licensing. The 80-square-meter house sheltered a family of 5 members, including 3 children. It should be mentioned that the Israeli forces had demolished Mhoammad’s house in 2016 under the pretext that it is close to the annexation wall. It should also be noted that Beer ‘Ona neighborhood was within Beit Jala’s lands, but it was annexed to Jerusalem’s municipality after the Israeli occupation of 1967. Moreover, most of Beer ‘Ona’s residents hold the Palestinian Authority’s ID card (green ID card), while they are supposed to hold the Jerusalem ID card (blue ID cards), noting that they pay the property tax to Jerusalem’s municipality. On Wednesday morning, 20 February 2019, Israeli Jerusalem Municipality bulldozers demolished 2 apartments and a horse stall in al-Ashqaria neighborhood in Beit Hanina village, north of occupied East Jerusalem. The first apartment built on an area of 72 sqaure meters and shelters Taysseeer Mohammad al-Mohtasseb and his family, which is comprised of 6 member, including 2 children, while the other apartment built on an area of 48 square meters and shelters Shadi al-Mohtasseb, Taysseer’s son, and his family, which is comprised of 4 members, including 2 children. Moreover, an 18-square-meter horse stall was demolished. Taysseer al-Mohtasseb said to PCHR’s fieldworker that he built his house in 2012 and paid a fee of NIS 42,000 and the Municipality refused to give him building permit or a license for the current building. He also said that at approximately 08:00 of the same day, he was surprised with by a great number of border guards, police and special forces ordering them to leave the house regardless of the court decision to postpone the demolition. It should be mentioned that the losses of Taysseer reached up to NIS 500,000. At approximately 09:00, on Sunday, 17 February 2019, Israeli forces raided a house belonging to Hatem Shaker Abu ‘Assab (45), from al-Qurmy neighborhood in the Old City in occupied East Jerusalem. They locked the family members in the house for 2 hours and ordered them to voluntarily evacuate the house for settlers, who obtained a judicial decision issued by the Israeli Supreme Court alleging that it is a Jewish house and tenants’ protection law has become invalid according to third generation law. The residents refused to evacuate the house, therefore the forces attacked them and arrested Hatem and his children Abdullah (13) and Mahdi (15) and then forced Rania Abu ‘Assab (40), his wife, and his Aunt to leave the house and give it to the settlers. The house is comprised of 8 and sheltered 8 members, including 4 children. It should be noted that the family continuously lived in the house since 1953 and never left it as 3 generation lived in it (the grandfather, the father and Hatem, the grandson). The tenants’ protection period lapsed when Hatem Abu ‘Assab’s mother died in 2014, according to the Israeli law. At approximately 10:00, on Thursday, 14 February 2019, Israeli forces accompanied with a bulldozer moved into ‘Ein al-Hejra, east of Dura, southwest of Hebron. The bulldozer damaged sheds that farmers of Abu Moqadam family made to sell vegetables produced in their land. The Israeli authorities alleged that the sheds were illegally established near bypass road (60). At approximately 13:30, on Sunday, 17 February 2019, Israeli forces accompanied with 2 bulldozers moved into Marakah area, in the eastern area of Beit Dajan, east of Nablus. The bulldozers started to demolish the 100-meter water line between al-Nassria village in the Central Jordan Valley and Beit Furik and Beit Dajan water well. It should be mentioned that the Israeli forces had suspended this project one year ago. Meanwhile, understandings between the Palestinian and Israeli liaisons to continue the work on the project. Mohammad Fahed Bani ‘Odah: demolishing a residential tent, 2 sheep tents and 3 60-square-meter barracks; a mobile bathroom, a 1500-cubic-meter tank and a 350-square-meter sheep barn. Fatma Suliman Mafthy Bani ‘Odah: demolishing a residential tent and a 100-square-meter sheep barrack. At approximately 12:00, on Tuesday 19 February 2019, Israeli forces accompanied with 3 Israeli Civil Administration vehicles and 2 mounted-crane trucks moved into al-Mas’udiyya area, northwest of Nablus. They confiscated 450m2 of street tiles out of 2760m2 located in Hayat al-Reef Park in the aforementioned area. The confiscated tiles belong to Thiab Sameeh Hejah, who owns the land and is from Burqa village, and his associates Ahmad Hussney Thiab Far’onia and Khaled Tameem Manssour Saelem, from the Burqa village, and Mohammad Jaber Salem, from Bizzariya village. Before their withdrawal, an officer identified himself as “Maeer”, who serves as the officer of the northern area in the civil administration, handed them a confiscation notice. The aforementioned civilians were told that the forces will come back to confiscate the rest of the tiles in the next day. It should be mentioned that the park is established on an area of 5 dunums, 3.5 of which are in (B) area and 1.5 in (C) area. At approximately 14:50, on Thursday, 14 February 2019, a group of settlers from “Yitzhar” settlement backed by Israeli forces moved into the east of ‘Urif village, south of Nablus. They raided ‘Urif High School for Males and lowered the Palestinian flag and tore it down. Meanwhile, a number of Palestinian civilians gathered and threw stones at the settlers. After that, the Israeli forces immediately tear gas canisters, sound bombs and rubber bullets at them. As a result, a 24-year-old male was hit with 2 rubber bullets to the back. He was then taken to Rafidia Surgical Hospital in Nablus, where his wounds were classified as moderate. At approximately 10:00, on Sunday, 17 February 2019, about 8 masked and armed settlers from the evacuated “Homesh” settlement in the east of Silat al-Dhahr village, south of Jenin, attacked a vegetable stall at the southern entrance of the village. The settlers stepped out of their vehicles and smashed the windshield of a car belonging to Abdul Kareem Jameel Ahmad Rabai’a (34), from Meithalun village, southeast of Jenin, which he uses to sell vegetables. Abuld Kareem immediately escaped leaving the stall on the street. Following that, the settlers stole some of the stall’s items. After their withdrawal, Abdul Kareem returned to take whatever was left of the stall in his bus then returned to his house in Meithalun for fear of his life. Full document available at the official website of the Palestinian Centre for Human Rights (PCHR).